Hey lefty libtards and feminazis! How about protesting about this? Every year, through the Global Gender Gap Report, the World Economic Forum quantifies the magnitude of gender-based disparities in 144 countries and tracks their progress (or more usually, lack of progress) over time. While no single measure can capture the complete situation, the Global Gender Gap Index presented in the report seeks to measure one important aspect of gender equality—the relative gaps between women and men across four key areas: health, education, economy and politics. As the World Economic Forum’s website explains: Talent and technology together will determine how the Fourth Industrial Revolution can be harnessed to deliver sustainable economic growth and innumerable benefits to society. Yet if half of the world’s talent is not integrated — as both beneficiary and shaper — into the transformations underway, we will compromise innovation and risk a rise in inequality. This urgency is at the core of a fresh call to action to accelerate progress towards gender equality, adding to the well-established economic case for gender equality. Moreover, there is a fundamental moral case for empowering women: women represent one half of the global population and it is self-evident that they must have equal access to health, education, earning power and political representation”. I have a tough question for all the lefty libtards and feminazis who are still throwing their toys around because they can’t get over the fact that the repulsive Crooked Hilary Clinton didn’t win the US presidency. 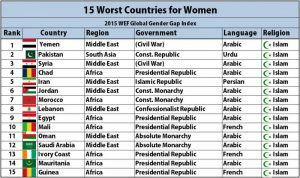 Here’s my question: lefty libtards and feminazis, can you spot anything that these countries have in common? I know it’s difficult. But if you really make an effort, you might find the one thing that all these countries share. Oh, and in case you were wondering, the next ten countries on this list of shame also have the same thing in common. So, lefty libtards and feminazis. Here we have a report produced by an independent international body which shows the countries where women have lives that are truly unimaginably awful. Will you soon be protesting outside the embassies of these countries? Or will you be protesting outside your local mosque? Oh, of course, you’ll be too busy getting ready to protest when President Trump visits Britain. So you won’t have time to protest at the horrific enslavement and brutal treatment of women in the 50+ countries that follow a certain religion. Dear libtards and feminazis, are you never ashamed or even disgusted at your own pathetic cowardice and hypocritical double standards? 3 comments to Hey lefty libtards and feminazis! How about protesting about this? It’s a good job none of those enlightened chaps are here doubling every generation isn’t it? Here’s a typical specimen (sorry speciperson) of the breed from feminazi paradise number 2. The shocking thing about this case is not the behaviour of the creature which is pretty common among its compatriots and indeed co-ideologists but the sentence from the judge (wonder what’s on his computer?) I’m glad our police aren’t armed, as a taser/baton to the arm would have prevented this poor little girl losing her innocence and father on the same day. German police are no doubt told that all cultures are equal and people are all the same under the skin so did not anticipate the father’s reaction being different to that of the average phlegmatic, authoritarian German. They would have done better to have been taught this instead. I forget who first predicted that Trump would literally drive the left mad but it has indeed come to pass. So-called Feminists are now seriously arguing that enslavement is freedom and empowerment is slavery; Western Civilisation is ‘literally’ Nazi Germany and we should be more like Yemen. Do not be afraid to laugh at them. They hate you anyway. « Who is responsible for *sl*mic terrorism? Yipeee!!! We are!!! !